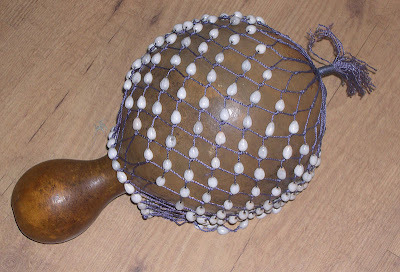 A shekere is a West African percussion instrument made from a dried gourd. A net is woven around the gourd with beads threaded into the mesh. The net is loose enough to permit movement but not so loose that it falls off. There are many different styles (this photo is from Wikipedia) but the principle is always the same. 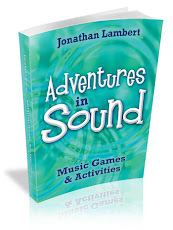 A number of different sounds can be produced by shaking, hitting with the palm and damping the instrument. The net can also be moved across the surface of the gourd in the manner of a cabassa, producing a sound somewhere between a scrape and a rattle. 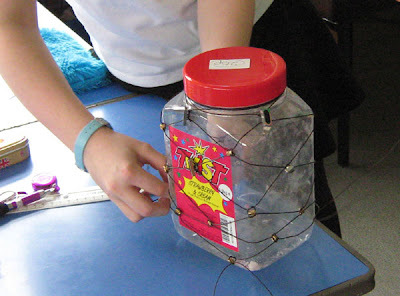 Cut the string into four equal lengths and feed each of them the handle of the bottle. Take one end of each piece of string and feed it through again. Make sure you have the same length of string either side of the plastic bottle and then fix it in place by taping it to the handle. Now take two neighbouring strands and tie them together with a simple loop, the first stage of tying a shoelace. Do the same with the remaining pairs of strands. You should now have the beginnings of two bows on either side of the bottle. Don’t pull these tight but aim to have them all at the shoulder of the bottle. 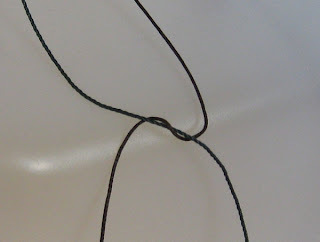 Take the strings from one loop and thread them through a bead, the strings entering from opposite sides. 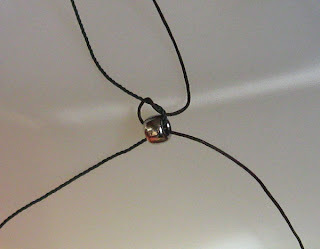 Pull the strings tight and the bead should slide into place just below your first bow. Now secure it in place with a second loop. Repeat this around the bottle until you have attached four beads. Next take one strand from each of two neighbouring beads, tie another loop about 5cm (2”) from each of the other beads and thread another bead in the same way as before, again securing it in place with a loop. Continue around the bottle in this way until you have attached another four beads. Negotiating the ends of the bottle, especially the end nearest the mouth, requires a compromise and you will need to allow a larger gap between beads. A net is emerging with a bead at each interstice. Work your way evenly down the bottle, always taking a string from each of two neighbouring beads for your next bead. Aim for a slightly loose fit to allow the beads to rattle against the bottle. 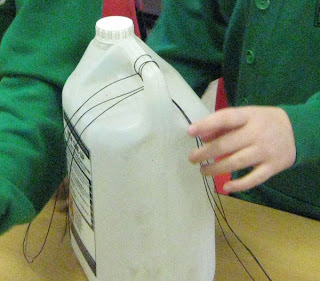 When you reach the bottom of the bottle, gather all the strings together and tie them in a large knot. This completes your shekere. Remove the masking tape from the handle and start playing. The bottles come with their own handle and I found some paintbrush handles to attach (with glue and a wide-headed nail) to the lids of the sweet jars. A short piece of dowel would do just as well. 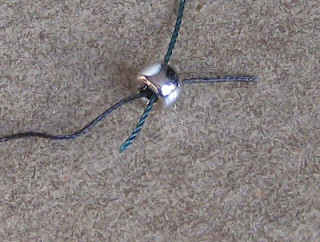 There are more elegant ways of finishing, such as tying threads from opposite beads and then trimming the excess string but, providing there is enough length in each strand at the end, the big knot method works regardless of mistakes made earlier in the process. The picture shows one nearly completed. I left my own in the school before I had a chance to photograph it but watch this space. Better than a poke in the eye?